Berggarten’ (translates as mountain garden) is one of the officinalis group which is the kitchen sage. It grows in a very shapely rounded manner and is a hardy evergreen. Berggarten rarely flowers which is an asset as that helps it keep its shape. ‘Berggarten’ is best grown in poor dry sunny soil. It likes cold winters as it is from Europe. 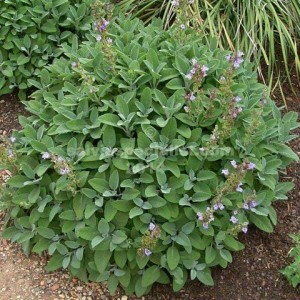 ‘Berggarten’ is often found in the herb section at nurseries. I don’t usually stock it.